One of the most popular conspiracy theories of recent times has been the "Moon Hoax" theory, which alleges that NASA faked the Apollo moon landings from 1966 to 1972. Many books, documentaries and websites have been devoted to this subject and a small industry has evolved around the alleged conspiracy. 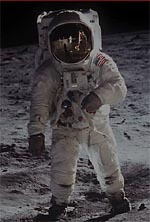 There is no credible evidence that the Apollo moon landings were faked. The evidence is conclusive beyond reasonable doubt that the Apollo moon missions were carried out essentially as stated by the official record. To find out how I came to these conclusions and to see if you agree, read on.